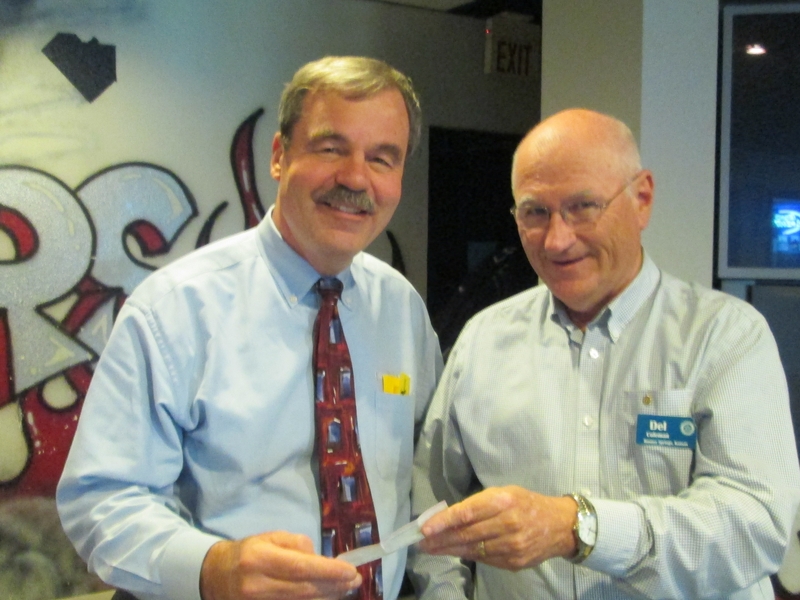 Bonner Springs Rotary Treasurer Del Coleman presents Agricultural Hall of Fame Board Member Charley Vogt a check for $332.13 to support Children’s Programs. The donations were raised during the Royals Paper Day event. Rotary designates half of the money raised for a local charity each year; The other half goes to support the Rotary Kids Camp in Lee’s Summit, Mo. Thank you to those Rotary members who were up early and braved the morning traffic to collect donations. This entry was posted in Announcement, Rotary Programs and tagged Agricultural Hall of Fame, Bonner Springs Rotary Club, Charley Vogt, Rotary Kids Camp, Royals Paper Day on June 24, 2013 by Bonner Springs Rotary Club.